(Please enter '1' in the quantity box for each pair of tickets you wish to purchase). This year, why not give away the gift of music? 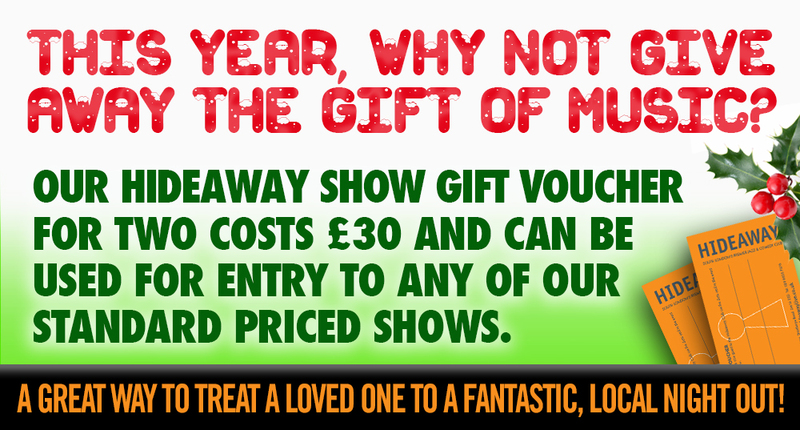 The "Hideaway Show Ticket Voucher for Two" costs £30 and can be used for entry to any live music show up to the value of £30. (You will be able to top-up for higher priced shows). A great way to treat a loved one to a fantastic, local night out! Please note vouchers are valid up to a period of 12 months from the date of purchase. Ticket value: Tickets or other entry deals for all of these products are valid up to a maximum value of £17.50 per ticket. Using these tickets to book for nights of a lower ticket price will fully redeem each ticket with no balance remaining as credit or cash value. These tickets cannot be used in part payment for more expensive shows, charity shows or for shows organised in co-operation with external promoters. Should the standard ticket price for a Friday or Saturday night increase during the period of the ticket's validity, then we will still redeem these tickets as if their maximum value had increased accordingly.